Woodhead Safeway® Pin and sleeve exposition plug is specifically designed for the expo center environment. 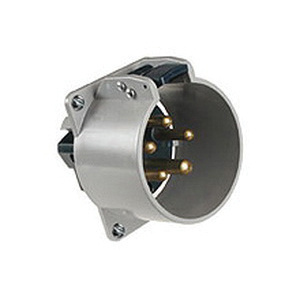 The wood head expo connectors provide a single device that accepts both flat and round cable. The durable lightweight construction and a non-conductive exterior provide compact versatility in 60A configurations. This plug is used for power distribution from ceiling drops, wall mounts and floor boxes to portable panelboards. Plug meets UL file E145923 and CSA file LR6837 standards.